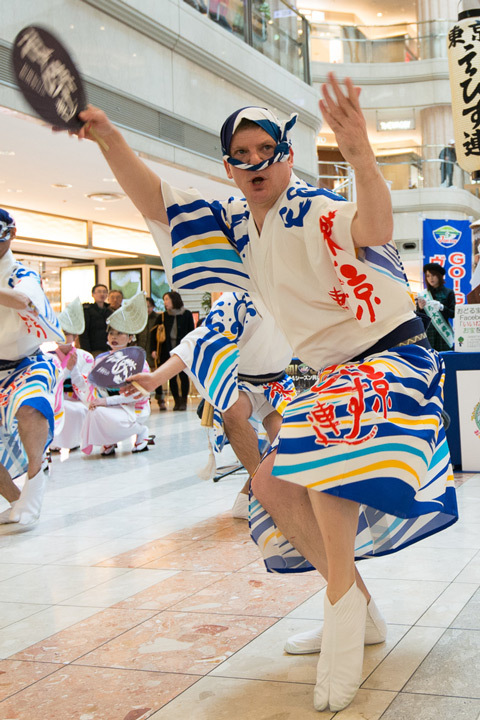 I've been learning and performing Awa Odori since early 2010 with Tokyo Ebisuren, a team based in Shibuya, Tokyo. I've been in charge of leading and teaching the otoko odori (men's dance) for around 3 years now. It's an enormously rewarding hobby, and one of those artforms where the more you learn, the more you realise you don't know. It requires a lot of dedication and discipline, and hard work with frequent muscle fatigue all year round. Every festival I've performed at has had a significantly exaggerated representation of visitors from other countries watching from the sidelines, and I'm often approached by people to ask what's going on, what it's all about. People from around the world, it seems, see Awa Odori for the first time and they're instantly hooked, but it's very rare to see any actually getting directly involved. It occurred to me that there just isn't that much information about Awa Odori available in English. General information you can find on Wikipedia, sure, but that barely even scrapes the surface. It also only talks from the perspective of an outsider looking in, and gives no sense of what it's like to actually participate in the festivities first hand. So that's where this site comes in. My team's summer festival season for 2015 begins this coming weekend, so I'll be sharing some of the experience here.